Are you in the "mood" for a fun giveaway? The 22 oz. Mood Stadium Cup is available in assorted colors and changes color with ice cold liquids. ideal for outdoor events, this USA-made item can be featured at company picnics, tailgates, festivals or competitive events. Warning: Severe weather conditions may effect the mood change. 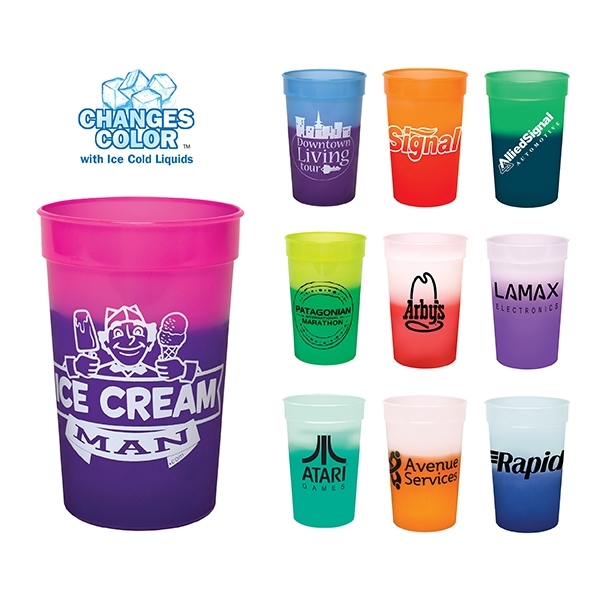 With your imprinted company name or logo, hand out this colorful promo at your next event and "sip" on some success! Size: 5.4375 " x 3.625 "
Imprint Size:4-1/4" W x 3" H per side. WRAP 8-3/4" W x 3" H.Please note wrap will not wrap completely around item. Please refer to imprint area in template. Multi Color Imprint; one side only.